Why do some leaders enjoy breakthrough growth and profits — Even sell their companies for millions — while others struggle to get by? That question has driven my research for several years. And during that time, I began interviewing breakthrough leaders: fast growth CEO’s, Entrepreneurs and Executives who had created breakthrough results. My process was to begin with the breakthrough then work backwards. Before anyone got a breakthrough – they took action. And what comes before action? Before anyone could take action, there had to be something to take action on; an idea, solution, plan, or experiment. 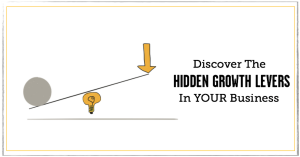 Where do breakthrough ideas that fuel high growth and profits come from? Are they just accidents? The invention of genius? The natural course of trying a lot of stuff? Learn some of the most powerful that very successful, fast growth and highly profitable Entrepreneurs and Founders revealed to me. And discover why you may be “working too hard”. Craig Stevens, Founder and CEO of Mar West Real Estate created an entirely new segment of property and association management when he realized that no one in 50 years had specialized in the unique needs of small business parks. Entrepreneur Shad Kirvin went from being just another guy renting bounce houses on the weekend to having one of the fastest growth event rental companies in Southern California with the simple insight that one type of customer was 20X more valuable to him than another. CEO of SmartReply, Dave Savage, catapulted his company’s growth with the simple insight that one market segment for his company was the key to recurring revenue. 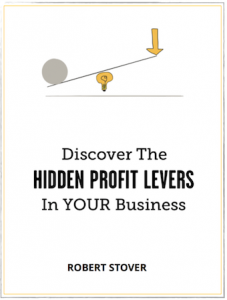 This insight, that “leverage points” drive breakthrough growth and profits is a big step forward in helping business owners and founders create more predictable breakthroughs: More growth, more profits, more often. In many of the breakthroughs I studied, the key insight was available for anyone else in the industry to see. Hundreds of bounce house rental companies have the insight available to them that some clients are 20X more valuable to than others – but only Shad Kirvin leveraged that insight into a fast growth company. What drives some leaders to see and seize an insight while others let it pass them by? I uncovered two answers. One of them may surprise you. In many cases it was a crisis the leader faced that preceded the discovery of the breakthrough insight. Dave Savage had his company’s future threatened by new legislation that drove him to search for a better way. Craig Steven’s had a falling out with his previous employer that set him on his journey to breakthrough success, Shad was frustrated at making less and less money as he was adding more and more customers. A business or organization that is struggling is in a better position to create breakthrough results than one that is sailing smoothly along. Now, what is the other precondition that often led to a breakthrough insight? You can’t interview leaders who are creating breakthroughs without noticing that they are driven. The status quo, incremental growth, and benchmarking just are not acceptable. Leaders who find breakthrough insights are leaders who are looking for them. You don’t have to wait for a crisis to find growth. But If you are not looking for more growth and higher profits, you not going to find them. That question alone determines your level of success in the weeks ahead.